Looking for an online slots game with the biggest winning potential? Try progressive jackpot pokies for your chance at some truly life changing wins. We’ve provided an overview of the best progressive jackpot pokies on the Web and where our international readers can play them – this guide is for overseas players only, as Australians can no longer play pokies online for real money due to changing gambling laws set from September 2017 onwards. A progressive jackpot is a prize pool which gets bigger every time a real money bet is placed on the same game within a linked network. Each pokies game starts with a base jackpot, which continues to grow until one lucky player manages to land a winning combination and claim the jackpot prize. Once the jackpot has been won, it simply resets to the base value again and the cycle repeats itself. This is the most popular type of pokies game you’ll find online, with many players becoming instant millionaires from a simple spin. Like all pokies, progressive jackpot games are entirely luck based, so winning is all about being in the right place at the right time. Online progressives offer some giant winning potential. As the jackpot value is constantly growing, the amount you can win is dependent on the game and the moment in time you’re playing. The jackpot currently up for grabs is always shown at the top of the reels, and is updated in real time so you can watch it grow before your eyes. Microgaming’s progressive jackpot pokies network is the biggest one you’ll find online, with a series of pokies starting with a base jackpot of one million dollars. The biggest ever recorded wins have been on these Microgaming games, as well as Net Entertainment’s Mega Fortune. Some lucky online players have walked away with wins in the tens of millions of dollars. Mega Moolah – Microgaming’s Mega Moolah series is the most popular and highest paying progressive jackpot network on the Web, offering four jackpots to be won – Mini, Minor, Major and Mega. 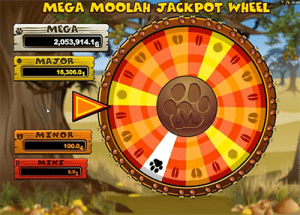 The original Mega Moolah pokies game uses an African safari theme, and while it’s a little visually outdated, it continues to attract a tonne of players thanks to its million-dollar base jackpot. The jackpot bonus is triggered at random, opening a wheel of fortune style mini-game where you get to spin for the chance to win one of the four progressive jackpots. Mega Moolah Isis – This game shares the same progressive jackpot network as the original Mega Moolah and follows the exact same format. The difference is Mega Moolah Isis uses an ancient Egyptian theme full of relics and lotus flowers. Geisha Wonders – NetEnt’s beautiful Japanese inspired Geisha Wonders pokies game offers two progressive jackpots, the Wonder Jackpot and the Mega Wonder Jackpot, with an average payout around the $10,000 to $20,000 mark. It also has a free spins bonus and features scatters and wild symbols. 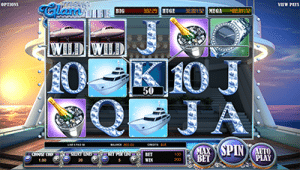 Major Millions – On the visual front, Major Millions is super outdated and offers a clunky three-reel format, but with an ever increasing jackpot in the hundreds of thousands of dollars, this Microgaming title remains hugely popular with online players. Mega Glam Life – Mega Glam Life is a 3D pokies game part of BetSoft’s Slots3 collection, offering a revamped version of its predecessor, The Glam Life. This blinged up game offers the chance to trigger the bonus wheel, which houses several instant cash prizes and three progressive jackpots – the Big, Huge and Mega Jackpots. The reels are filled with symbols of the luxury items you could purchase if you strike it lucky, like sports cars, diamond encrusted jewellery, yachts and expensive champagne. 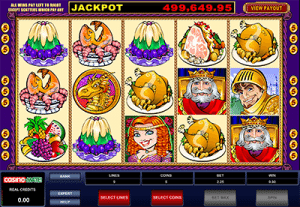 King Cashalot – This is another Microgaming pokies game wildly outdated but which remains popular thanks to its giant jackpot which typically sits around the $500,000 mark. It uses a theme of medieval royalty, with symbols featuring kings, knights, and a feast of epic proportions. The maximum bet needs to be active for the chance of winning the progressive, which is only $2.25 per spin. Progressive jackpot pokies can be found at all of our recommended online casinos, and they have a category of their own to make it easy for you to locate these lucrative titles. The Microgaming progressives are the most popular games, but you’ll also find a range of smaller progressives available from software developers like NetEnt, BetSoft, Playtech and iSoftBet. Unlike other online pokies which can be sampled for free in practice mode, many progressive jackpot pokies require real money bets in order to play. Sign up for an account using our links in the table above to make a safe deposit and claim a welcome bonus including bonus money and free spins along the way. Play Microgaming’s giant progressive jackpot pokies games like Mega Moolah and Major Millions at Casino-Mate and claim up to $1400 in matched deposit bonuses.